Owen Hamm and Tyler Smith wrap fascines during the lesson. 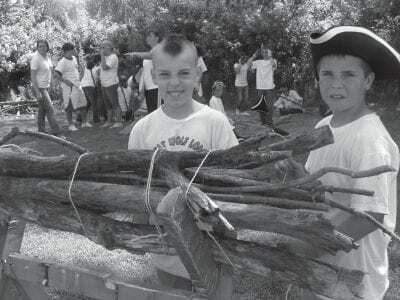 Children at the C.V. Starr Intermediate School in Brewster now understand what it meant to live in the 18th century. “It was really hard work,” said Owen Hamm, a 10-year-old f… Please login below or purchase a subscription to the Putnam County Courier to access this content. State Senator Vincent Leibell is welcomed to the new environmental science lab bearing his name at the rear of Brewster High School by teacher Rob Leonard and student Holly Esser who presents the senator with a plant grown onsite. 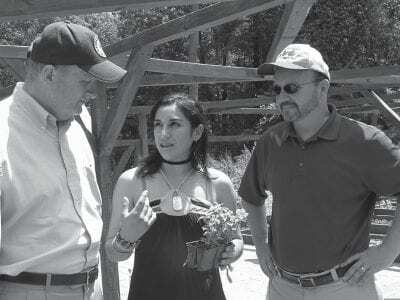 An ecological scie… Please login below or purchase a subscription to the Putnam County Courier to access this content. The checks are in the mail. Putnam’s six towns and three villages will be receiving mortgage tax reimbursements from the county any day now following legislative approval of the report covering October 1, 2009 through March 31, 2010. The … Please login below or purchase a subscription to the Putnam County Courier to access this content. The circus comes to Brewster next week. The Kelly Miller Circus will be present two performances on June 16 at the site of the former Golf Dome off Route 22 in Southeast. The Brewster Education Foundation in conjunction with the Brewster Fire D… Please login below or purchase a subscription to the Putnam County Courier to access this content. Courtney Monsees loves her hairstyle created by On Line professional Shannon Franzese. The girls felt really special when entering On Line Hair Design in Brewster. For the 18th consecutive year, the salon located off Route 22 closed its business … Please login below or purchase a subscription to the Putnam County Courier to access this content. 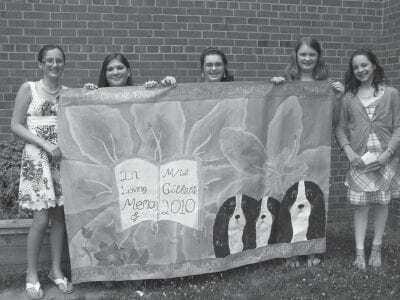 Five 7th graders created a mural to remember their beloved teacher. The girls include (l-r) Sara Anderson, Tina Bueti, Kathleen Fennessy, Kaitlin Ford and Cara Pizzaorusso. Barbara Gillette loved nature. It was only fitting that the Henry Wells Mi… Please login below or purchase a subscription to the Putnam County Courier to access this content. 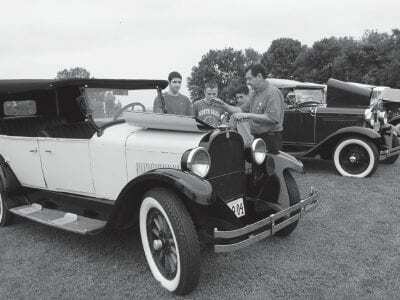 Mike Mongiello explains engine design of a Model A Ford to students in North Salem. Technology classes took to the outof doors at the North Salem High School-Middle School when a group of classic car enthusiasts brought their antique vehicles on cam… Please login below or purchase a subscription to the Putnam County Courier to access this content. 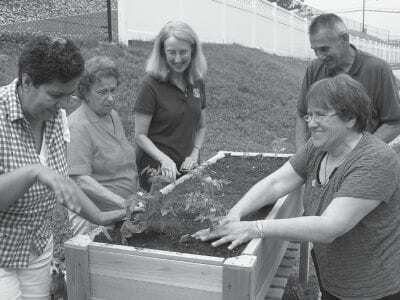 Rotarians Lisa Gold and Al Lotrecchiano assist Gleneida Court residents Linda Hall, Maria Lugo, and Dottie Brown plant tomato plants in raised gardening beds. Carmel Rotarians are once again demonstrating their motto of “service above self&rdq… Please login below or purchase a subscription to the Putnam County Courier to access this content. A cheer rang out at the Mahopac Library late Tuesday. Residents in the service boundaries of the Mahopac School District approved a $2.6 million budget by nearly a 2-1 margin 527-283. Library director Patricia Kaufman thanked the community for … Please login below or purchase a subscription to the Putnam County Courier to access this content.